On May 28, 2014 United Jewish Appeal of Greater Toronto’s Community Connect proudly hosted its 6th annual BAC2Fashion charity fashion show at the Warehouse Event Venue. The young adults involved in this exciting event exceeded their fundraising goal, bringing in more than $55,000 to support UJA’s seniors’ initiatives. The gala event began with a cocktail reception in a beautiful ambiance with the sounds of Tino Pop Violin. The runway show was a smash hit, featuring the looks of top Toronto fashion providers, as well as live musical performances including young pop artists Tyler Keating and Daniella Watters. Eight fashion providers were showcased on the runway, including BAC2Fashion veterans Over the Rainbow, Shenkin West, Intuition Toronto, Tana+Bee, Jerome’s Menswear, & Sense of Independence. New additions to the 2014 runway included two young, Jewish, up-and-coming designers from Toronto Jilian Dayna and Masha Apparel. This event was spearheaded by 4 passionate community leaders in their early 20’s: Nicole Inwentash, Carly Goldberg, Jilian Naiberg and Hannah Gofman. 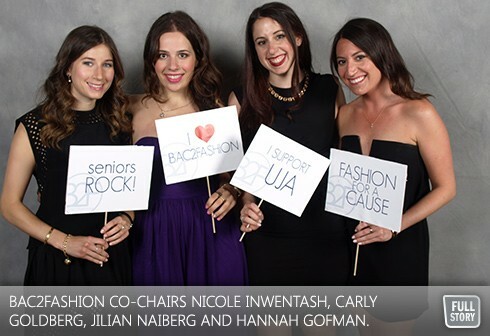 BAC2Fashion seeks to bring more attention to seniors' needs, and help improve their quality of life by connecting them to much needed resources, supports and programming allocated through UJA. Funds raised through BAC2Fashion are directed towards Healthy at Home, which brings social, recreational, and educational programs directly to the seniors where they live in order to reduce isolation. Funds also support the Holocaust Survivors Emergency fund, administered through UJA beneficiary agency Jewish Family and Child, which provides basic financial assistance to Holocaust Survivors in order for them to live in dignity, as well as Circle of Care’s home care program for Holocaust survivors, providing them with kosher meals, transportation and in home services. The BAC2Fashion team recognizes that earlier generations are the backbone of our community. They have motivated the younger generation to follow in their footsteps and become trendsetters, both with our style and our actions. “The grandparents in our lives made sure that we grew up with an immense amount of love and support, and we want to make sure that we give that love and support right back to them and all the other seniors who need it as well,” said Jilian Naiberg. This initiative run through UJA’s Community Connect (CoCo) has now raised almost $250,000 to support essential programming, while engaging hundreds of young adults in their 20’s & 30’s in meaningful volunteer work. But, make no mistake; BAC2Fashion is about much more than just fashion. Alongside the fundraising and fashion show, the B2F team sees it as essential to ‘Live the Cause’ and put their time, energy, and enthusiasm into giving back through hands-on, direct volunteering with seniors. “BAC2Fashion has truly proven to all those involved how amazing it feels to support our community,” said Gofman. BAC2Fashion is just one example of the many projects run by and for young adults through UJA’s Community Connect. The CoCo team works with Taglit-Birthright Israel alumni, as well as the broader young adult network in Toronto, to connect young adults to opportunities in the community that are interesting and meaningful to them. Be it through large scale projects like BAC2Fashion, the Hoops Basketball Tournament and the Joel Schwartz Memorial Hockey Tournament, smaller scale niche focused events (holidays, business, environment), or leadership opportunities, there are many ways for young people to get involved and help continue to build our strong, vibrant Jewish community.